Welcome back to the usual recipe segment with your mediocre INSIDER staff – me! This week I decided to tackle one of the recipes that I have been longing to do for quite some time but never got around to make it work. It is no other than Poutine – a Canadian classic which contains every allegedly unhealthy thing you could think of. But hey, it tastes amazing and that is all matters. A little disclaimer: this is NOT the traditional recipe since I have made certain alterations (e.g the cuts of the fries, the broth, the fat in the gravy, etc) so anyone who is of Canadian descent, please don’t come for me. I once had an Italian writing “An Italian grandma just died for that x_x” on my Macaroni salad recipe which is not even from Italy. But anyhow, let’s get started. Mix cornstarch with water, set aside. In the meantime, melt the butter and lard in a large saucepan then add the flour, stirring continuously to prevent burning for ~5 minutes. Pour in the broth and bring it up to high heat. Add the cornstarch mixture while still stirring. Once bubbles form, turn it down to medium-low heat and keep stirring till the gravy begins to thicken. Season with black pepper. Fry the potatoes until golden brown (preferably in a deep fryer). Place them on a paper towel lined plate to absorb the excess oil. Put the fries into a large bowl, add a few pieces of cheese curds; then pour in a generous ladle of gravy and comes another layer of cheese curds. Serve while hot. There you go, my take on an infamous Canadian delicacy. 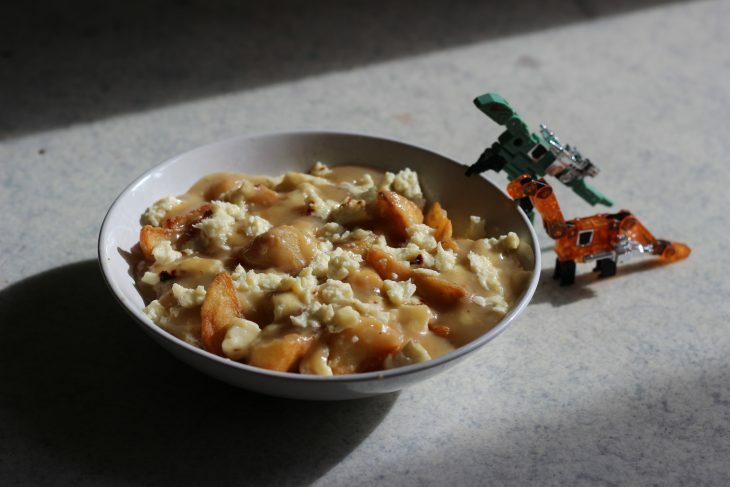 Poutine can be both enjoyed as a snack and a main dish. How about giving this a try the next time you have a gathering?